Make light work of family feasts with this impressive double oven from Bush. Equipped with 4 ceramic hobs, which are ideal for quick heating and easy cleaning, this oven gives you double the space to cook up your favourite meals. With both a grill and oven in the top, and the main oven with digital timer below, there's plenty of space to cook up the Sunday roast and more.Forgotten to take your food out of the freezer? thanks to the defrost option, there's no need to panic. Comes completed in a contemporary black finish to suit any kitchen.General Information:2 functions for versatile cooking- includes .Digital clock.Digital Full Programmable TimerOven door window glazing: double glazed.Front mountedMain cavity:Conventional cavity.2 shelves.58 litre usable capaci. Only confusing bit is the top oven use, could have better instructions how to use it but otherwise a very good cooker. Indesit KDP60SES Integrated 60cm Double Dual Fuel Cooker - Silver. Hotpoint HUE61PS Free Standing 60cm 4 Hob Double Electric Cooker - White. 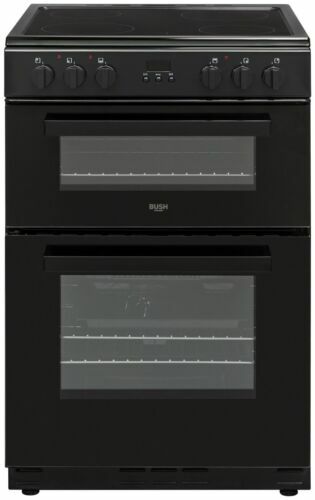 Hotpoint HUD61KS Free Standing 60cm 4 Hob Double Dual Fuel Cooker - Black.